Based on experience, the challenge of sticking to a meat-free diet becomes even more difficult when you go out of familiar surroundings. Chop Suey Guisado Rice Topping on Hap Chan's menu. The most convenient option is to go into a restaurant and request for vegetarian and vegan options or ask them to veganize your order. Not all restaurants would fulfill this request but I was lucky that Hap Chan Tea House in Eton Centris accommodated me. Aside from the fast food chains with red as their dominant color, there was Hap Chan Tea House which stood out to me with their green signage. I hoped that they had meat-free options on their menu but it seems there were none. I resorted to my last option and I am so glad I had the courage to do so. 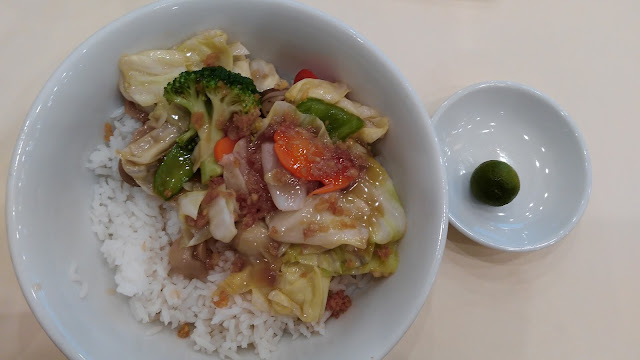 The only affordable veggie option on their menu was their Chop Suey Guisado Rice Topping (Php130). I asked if it had meat in the ingredients and I was told that it had ground pork. I asked if they could take out the meat and he said yes. I also asked if they could put less salt and also said yes. The sauce for this dish is vegetarian oyster sauce so that's why I opted to order this in the first place. This already made me feel satisfied but he asked me if I wanted to order some drinks or smoothies. 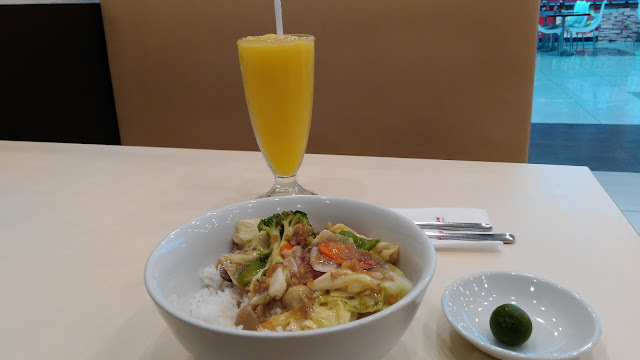 I checked the menu and I immediately ordered the Mango Shake (Php75). I asked again if they put milk and syrup on their shakes and he replied yes. So I requested that they not put any milk or syrup for my order and he confirmed my order. A few minutes later, my orders arrived. Veggies and Rice with lots of garlic bits instead of meat. 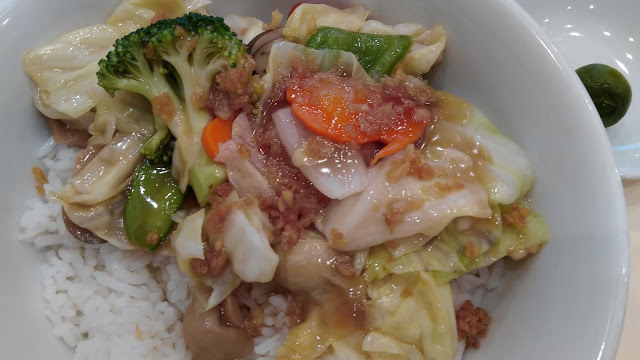 When my chop suey arrived I noticed that there were a lot of garlic bits which resembled ground meat. The chef or cook must have still wanted it to look like their regular order of chop suey and added lots of garlic bits to make up for the absence of meat. I didn't mind at all because it made the sweetness and crunch of the veggies even more pronounced. The mushrooms were also meaty enough without the need for meat. The absence of meat also made this dish less oily. This dish really filled me up. If it was possible to enjoy this with no oil, I would definitely opt for that. The mango shake without the syrup and milk had lots of crushed ice which diluted the natural sweetness and tartness of the mangoes so I had no complaints. This simple and healthier lunch filled me up and didn't give me the groggy feeling that one gets after a heavy and sugary meal. I had the energy to complete my errands for the day. I'm not sure if my orders were customized because there weren't a lot of people at the time but I am grateful that my preferences were respected. "Ask and you shall receive", is the lesson that I learned based on this experience. You may not always get what you ask for but I think it's worth trying. I am sometimes embarrassed to ask waiters to customize my order to my liking because I know it is an inconvenience but if a lot of us ask and keep asking, more restaurants may start providing meat-free options for its customers.